This project originated as a way to combine a small sustainable farming business with the empowering (literally) of a rural village without access to the electrical grid in Laos. Today more than 30% of Lao homes still do not have power. But rather than risk the possibility of failure and the associated disappointment it would bring, to myself as well as any villagers involved, and because of the very real potential the model has to reduce rural poverty, I’ve decided it’s prudent to prove the model first. When (if?) it’s proven successful, an international organization such as JICA, or an NGO with good intentions, could implement it better than I could. The farm and its facilities could then later fulfill its original purpose in the form of a training center for sustainable development. I’ve had a passion for sustainable farming techniques and building methods for more than a decade, and this project is the culmination of a seemingly endless array of false starts and projects left with loose ends. But I think this behavior of mine is similar to the molecules in a solution, bouncing around and off one another, much like the random thoughts and seemingly useless information that swirls around in one’s head. The process speeds up until all it takes is a seed, of sorts, to transform that saturated solution to crystal. My FJ55 Land Cruiser (now put to pasture) after a long journey from Vientiane to Luang Prabang and back. 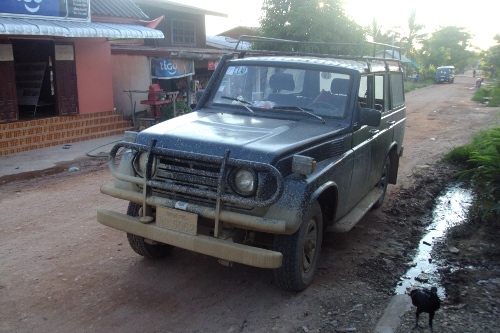 I think that random, yet essential, seed, floating about as imaginary seeds do, flew into the open window of my faithful if fickle ancient Land Cruiser, in company with the fresh, cold, mountain air, on the winding road in the highlands between Vientiane and Luang Prabang.